Gurgaon-based One MobiKwik Systems Pvt Ltd, which runs online recharge platform and mobile wallet venture MobiKwik.com, is in advanced talks with more than three large VC funds in India, Southeast Asia and the US to raise $20-30 million in a Series B round of funding, a top executive of the company told Techcircle.in. MobiKwik had earlier raised under $5 million in its Series A funding from an unnamed US-based VC firm last year. "We are in advanced talks with a few investors, whose names cannot be disclosed as of now," said Upasana Taku, head of business development and merchant operations at MobiKwik. "We will close the round by the end of this month. The capital will be used to build a strong brand by launching aggressive marketing campaigns, in addition to hiring talent for leadership roles and expanding operations to Bangalore and Mumbai," said Upasana Taku, co-founder and head (business development and merchant operations) at MobiKwik. 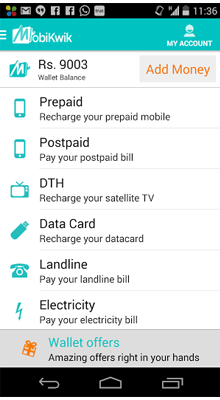 Founded in 2009 by Bipin Preet Singh (CEO) and Upasana, MobiKwik enables prepaid mobile, DTH and data card recharges, post-paid mobile bills payment and utility bill payment for electricity, gas and landline connections. It also offers these services via SMS, phone and apps that are available for Android, iOS and â€‹â€‹â€‹Windows platforms. The firm recently revamped its website and logo. The company claimed that it has partnered with more than 5,000 businesses across e-commerce, online food ordering, cab services and QSR chains in the country to offer digital wallets so that consumers can directly pay from their wallets while shopping online. Consumers can also make P2P money transfer using the wallet. According to Upasana, MobiKwik has 10 million registered users. The platform sees more than 2 lakh transactions per day, of which 5,000-10,000 are happening across e-com platforms. Mobile contributes more than 85 per cent of the total business, she said. "In terms of sales (transaction value), we did Rs 40 crore in FY13 and Rs 200 crore in FY14. We now expect to generate Rs 1,200 crore in FY15," Upasana added. She added that the company is fast turning out to be a mobile-only business, and the web platform will be redundant in a year or so. Currently, the company is aggressively focusing on India. However, it is planning to foray into various foreign markets in Asia and Africa by mid 2015. "We are looking at certain markets like Philippines and Vietnam in Asia, and Kenya in Africa where the smartphone penetration is going up. We plan to set up offices there," Upasana added.